The world appears far from getting a grip on world oil-fueled shipping. The ongoing consequences are well known, but periodic disasters get our attention. A collision and spill of at least 168,000 gallons of marine fuel happened on March 22 near Houston, Texas. It closed a major petrochemical shipping route. Each spill, we have seen over the decades, does practically nothing to stop the next one, and the next one. News items surface for a couple of days, only to disappear unless there was dramatic loss of human life. The public's glimpse of every major pollution event is fleeting, while the polluting interests and impotent "relevant" government agencies carry on. 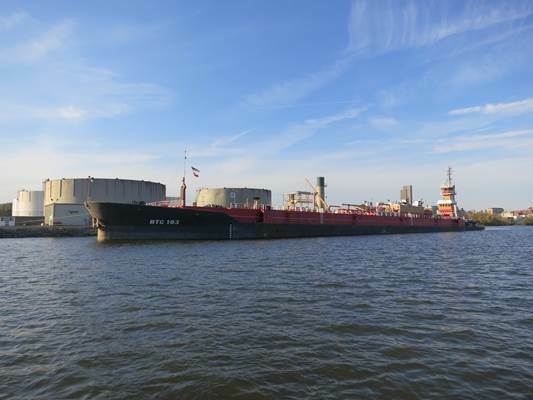 "Galveston Bay in Texas has averaged 285 oil spills per year since the late 90s... fifty billion gallons of oil are transported through the gulf annually," said Shipping & Logistics Industry Today/Resource Investing News on April 11. Hundreds of thousands of perhaps 330 kinds of birds fly along the Texas coast where they feed and rest during migration. It can be a very dangerous time for them, as they must gain enough body-weight to reach their destination -- for some it's as far north as the Arctic. The bird in the picture at top was unlucky enough to meet up with the March 22 marine-fuel spill into Galveston Bay. This is the peak of the migration period for birds in the region. The oyster beds are natural filter systems in estuaries, but can they filter bunker oil? An on-the-scene reporter for Sail Transport Network gives his observations and raises several other questions, at the bottom of this webpage. While stronger regulations for the maritime-petroleum industries, and rapid, thorough clean-ups are essential, the public is led to believe that there is nothing that can change the status quo. Recall President Obama's tough talk about making BP pay for the 2010 Gulf blowout and contamination -- he made no mention of ceasing current practices in wasteful consumption to cut petroleum dependence. 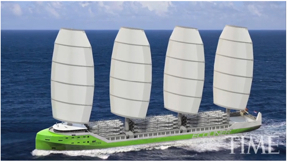 While thousands of polluting ships ply the seas -- over 70,000 ocean-going ships, not including barges such as this one that emptied about one fourth of its heavy bunker fuel cargo -- the alternative to oil pollution, i.e., wind energy transport (i.e., sailing without oil), is almost never mentioned. But it has been advancing steadily to the point that it should be the solution placed into the markets starting today. It cannot replace the huge volume of world trade done via oil, but much essential trade could be managed with sail power. Why not, when today’s large cargo vessels’ speed has dropped below that of the clipper ships of the 19th century? The typical objection to this "romantic" and "impractical" solution is that we would have to forego the present volume of consumer goods. But we must also start embracing a rational scale of world trade and consumption. The reasons are -- not necessarily in this order, depending on one's priorities -- ecological, energy-resource limits, and economic. "What, economic you say?" Yes, the gross inefficiencies of the heavily subsidized yet struggling oil extraction industry assure that almost everyone's complicity in frying the planet translates to a much constrained economic and ecological future. One of the ships in the Houston collision was 585 feet long. Such volume of trade is unsustainable, and ultimately very unhealthy for any local economies dependent on their local ecosystems and food supply -- and what local economy is really exempt, soon enough? A steadily advancing example of the future now is Greece. Until the "mortgage crisis" hit, Greece had been "growing" -- as long as massive debt and subsidized energy made overconsuming enticing and justifiable. Now the façade of conspicuous middle-class wealth has started to crash down, revealing government to be close to irrelevant. Greeks are pursuing localized strategies to survive, such as eliminating the Middle Man, going "back to the land," doubling up households, and refraining from using expensive heating oil and electricity. Fitting into the new reality is sail transport, whose revival has begun with baby steps, intent on emulating recent developments in northern Europe (see links at bottom). The 70,000 conventional cargo ships typically move, for example, an astronomical number of plastic Chinese basketballs, millions of tons of food that should instead be grown much closer to the point of consumption, millions of cars to individual polluters, and also ship (via tanker) billions of gallons of oil itself -- all to keep the corporate economy humming. Yet, just 16 (sixteen) of those 70,000 ships belch into our air as much sulfur and other pollutants as all the world's cars. Although this fact has been known for years, the shipping industry still eludes adequate pollution regulations in these times of climate change and steps toward renewable energy reliance. The maritime industry has put forward an approach to its air pollution: it aims to deal with the sulfur emissions and the deaths it causes globally by installing scrubbers on ships and accepting low-sulfur regulations coming down the pike. However, this approach, loved by both industry and government, can succeed only in creating an improvement equivalent to only perhaps 26 ships spewing out into the air as much sulfur and other pollutants as all the world's cars. If that were not myopia, the shipping industry is telling itself that there will be decades of plentiful oil. An oil crisis, such as the two in the 1970s, is not on their radar. The main alternative fuel being touted and planned for is liquified natural gas (LNG ) -- which cuts only 25% of the CO2 emissions from heavy fuel oil relied upon today. Sailing is not being considered enough within the industry, except by a few visionaries in the EU (see link at bottom). This neglect is due to the fact that the shipping industry had a production crisis similar to the mortgage crisis -– but the high inventory of old and polluting ships does not justify the lagging behind of clean energy innovations in the industry. While business-as-usual chugs along on our blue/oily planet, there are the inevitable spills, explosions, derailments and everyday waste caused by shipping by oil. Most recently the Houston Shipping Channel’s fender-bender showed that all the sophisticated technology and training for safety does not prevent ecological and public health disasters. (See news summary and links below.) Surely, with inevitable human error and the ongoing poisoning of the environment by petroleum, it is time to think outside the box. Perhaps the chief obstacle in doing so is the long identified problem of externalities: there is no profit in saving ecosystems or sparing people's lungs from soot, sulfur and poisoned water; there is no cost for abusing the environment and the public. The shipping industry demands -- as does the entire corporate economy and its compliant governments -- business as usual for "endless" growth in trade. What about Peak Oil? Diminishing net energy from petroleum extraction? Unending subsidies for petroleum industries that conceal the true costs of petroleum products purchased by billions of consumers? Persistent externalizing of environmental and public health costs? -- forget about them all, and ignore the sail transport option, if your investment is in modern oil boats; i.e., conventional cargo vessels. However, this standard attitude is starting to waver and be questioned. Fortunately, the sail transport movement is on the rise. For example, the 32-meter schooner-brig the Tres Hombres is now completing its last leg across the Atlantic back home to Holland, on its fifth voyage bringing rum, chocolate, cacao and coffee from the Caribbean. 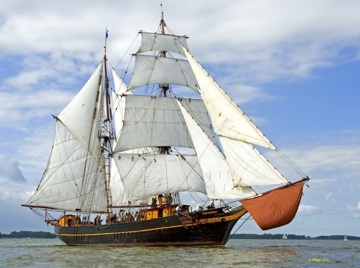 Plans for more sailing ships are moving along in much of Europe. No doubt the U.S. will eventually follow suit, if it wants to stay at the helm of innovation and clean energy solutions. Now for more insight and details on the Houston bird sanctuary oil spill. This oil was ship fuel for other ships. As soon as we heard about the disaster, the Sail Transport Network (STN) called upon the Houston Audubon Society to join efforts to support clean, renewable-energy shipping. Our Houston area STN correspondent was activated and has been a great help. 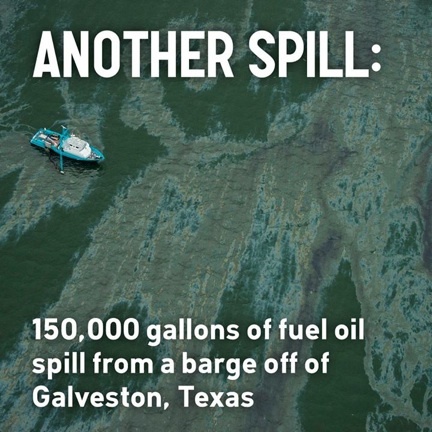 "A barge carrying about 900,000 gallons of the heavy oil collided with a ship Saturday in the busy Houston Ship Channel, spilling as much as a fifth of its cargo into one of the world's busiest waterways for moving petrochemicals" -- aol.com/AP, March 24, 2014. The Houston Chronicle published on April 5th, "A portion of the oil was blown into the Gulf of Mexico and drifted south to the Matagorda Island area... So far, 258 oiled birds have been recovered, only eight of them alive, said [the] U.S. Coast Guard..." See 3 rehabbed birds return to wild after Galveston oil spill, by Craig Hlavaty. The official clean-up website www.texascityyresponse.com issued a release on April 6: "Response efforts continue on South Matagorda Island, Mustang Island and Padre Island National Seashore"
The official link for the spill includes a map that seems to hope oil will not drift: "Safety Zones". Note the logo for Kirby, the oil-spiller, on the map. The logo is also on the Coast Guard and Unified Command websites. This is like having the BP logo on the U.S. Environmental Protection Agency website (if it's not there already). "Skimmers are trying to recover the oil and a boom is in place to protect the area's environmentally-sensitive mud flats. The remaining oil is being removed from the sunken barge. People worked through the night with infrared cameras to locate and skim the oil. Jim Suydam, a spokesman for the General Land Office, said the oil is 'sticky, gooey, thick, tarry stuff. That stuff is terrible to have to clean up,' he said. Richard Gibbons, conservation director of the Houston Audubon Society, said: 'The timing really couldn't be much worse since we're approaching the peak shorebird migration season.' He said tens of thousands of wintering birds are in the area." "This one is bigger. And in the already wrecked Gulf of Mexico. And it's a heavy oil that might sink." Readers were referred to the texastribune.org story, and treated to the disturbing photo shown above. Climate activists are starting to look at the maritime industry and see how everyday consumer items are shipped via oil from afar. 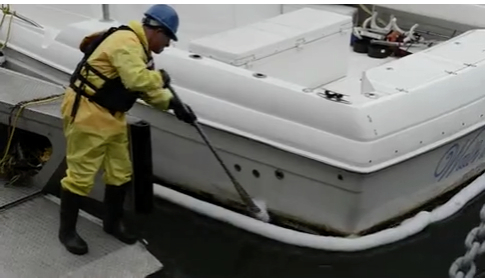 Over 500 vessels were affected and cleaned. This is nothing compared to the fact that the Laguna Madre and Padre Island is Texas' premier vacation spot, the last place cleaner water could be found. I believe that Kirby is being blamed. The state is also going to fine the operator. It was a barge full of bunker produced by Kirby inland marine which is owned by parent company Kirby Oil. As to who's fault it was is still under investigation. Here's a good article citing the accident. Here is a wiki related for Kirby and how they got started. John Henry Kirby -- "The Prince of the Pines" and "The Father of Industrial Texas." Looks like they've got a really fantastic track record of polluting the Intracoastal Waterway (ICW) for many many years! We call it Stinkadena for a reason (Pasadena)! Local news reporters aren't talking about short and long term effects. 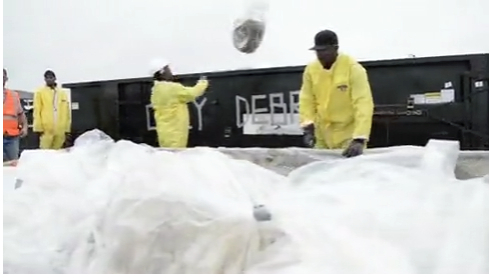 They are saying no dispersmants yet the cleanup will be collecting tar balls as it washes ashore. What a great solution! Part of the big problem saving birds is getting to that remote area where they are, and then transporting them. That's why in coastal flats at low tide, shallow-draft sailing vessels could have contributed a great deal to helping logistically! 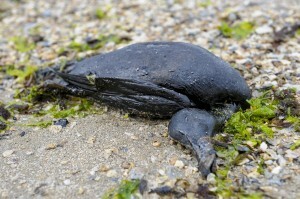 Beaches are inundated with oil, and there is a big f*cking mess of nasty tar and oil all over. I would say someone is lying about "cleanup" and making it appear everything is under control. portofhouston.com's statement on the Houston Ship Channel status. uscgnews.com, an example of most news organizations' appearing to just be copy/pasting the USGS public report. When the whole shipping channel was shut down, some 100 vessels were stranded for 5 days. I wonder how many dollars it costs per hour to do that. It is the general consensus of amateur anglers in the metro area that you don't consume fish from the bay or a 200 mile radius. People know the water is dirty but once PCB, Dioxin, and Mercury levels accumulate to high levels it never leaves the ecosystem entirely. There is no current answer to the problem. The old paper mill near San Jacinto hwy 90 bridge is a U.S. EPA superfund site. Quite sickening. The most concentrated levels of pollutants in all of Texas. The 2nd most polluted area is the Trinity river from North of Fort Worth to south of Dallas. If a consumer can more accurately see the carbon footprint of the products we use, from creation to extinction, he or she may have a greater capacity to understand why buying local matters, and why sail transport offers a very effective real-world solution for local and long distance shipping. Learn about the Ecoliner to be constructed and launched through the EU project the SAIL consortium in the North Sea. …for this informative and passionate article. We DO need culture change, away from greed toward cooperation and decency. Those companies are run by people, who are guaranteed not to be able to take their bank accounts with them when they die.